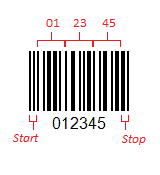 Code 25 (also called Code 2 of 5) is a linear or one-dimensional (1D) barcode. 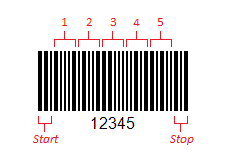 This means the barcode is composed of a single set of varying width vertical lines (black) and spaces (white). The data in the barcode is represented linearly by these black/white patterns (also called bars/spaces). Code 25 is a numeric symbology: it can only be used to represent the digits 0 through 9. There are actually two Code 25 symbologies: Code 25 Industrial and Code 25 Interleaved. Both symbologies uses two-width encoding (narrow bars/spaces and wide bars/spaces, with the wide width being 2 to 3 times the narrow width). Each data character consists of 5 bars/spaces, 2 of which are always wide (hence the name, 2 of 5). Code 25 Industrial is further characterized as a discrete barcode; each data character in the barcode is separated from the next with an inter-character gap (a single narrow space). This inter-character gap does not represent any data. In contrast to Code 25 Industrial, Code 25 Interleaved is a continuous barcode symbology; there is no inter-character space between adjacent data characters and the space between characters is part of the data representation. Since Code 25 can only represent numeric digits, its uses are limited. The lack of a standardized check digit and its relatively low density further limit the barcode. Code 25 Industrial was used initially in the logistics industry, primarily on the cartons of some products (though it has since been displaced by Code 25 Interleaved). With its higher data density and self-checking symbology, Code 25 Interleaved is used more commonly. The GS1 ITF-14 standard uses Code 25 Interleaved for carton labeling, where the cartons contain products which in turn are typically labeled with UPC or EAN barcodes. 135 film (35mm) canisters use a Code 25 Interleaved barcode which is scanned by many film-processing machines when the canister is inserted for developing. Deutsche Post (DHL) uses two variants of Code 25 Interleaved: Identcode and Leitcode. How do we help developers using Code 25? The Cognex Mobile Barcode Scanner SDK supports Code 25 detection, enabling developers to gather relevant workflow and application data. You can download the SDK for free by registering on the Cognex Mobile Barcode Developer Network. In addition, the Barcode Scanner SDK supports a broad range of symbologies to meet your growing development needs.